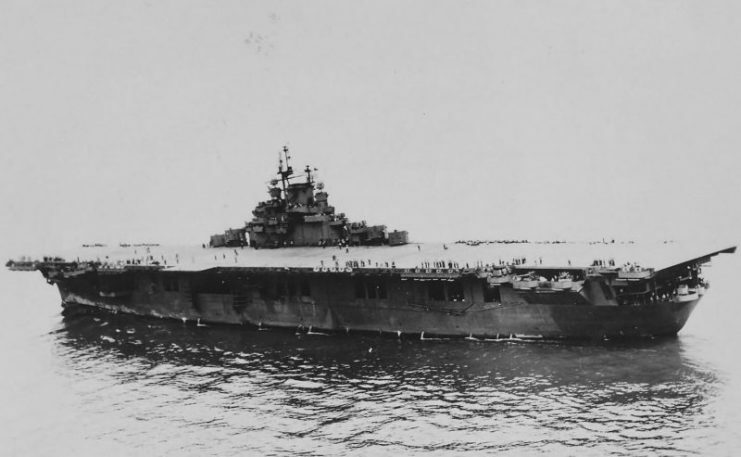 The Essex class aircraft carrier USS Bunker Hill became part of the United States Navy’s inventory of ships in 1943. 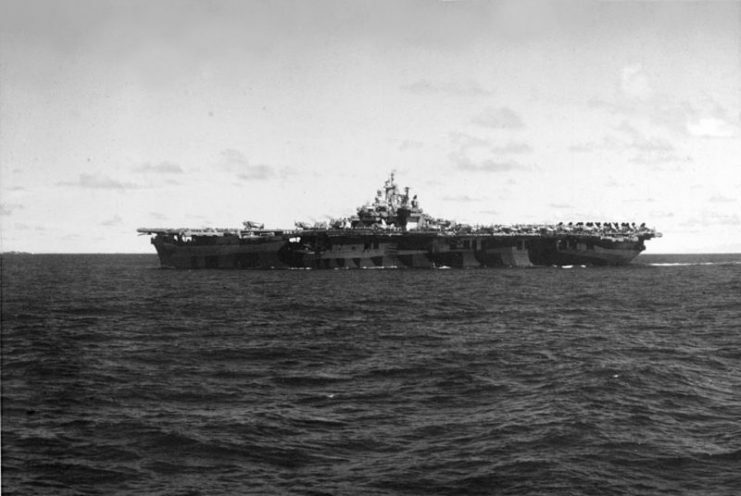 Named after the Battle of Bunker Hill and nicknamed “Holiday Express,” the Bunker Hill was used to support the Allied efforts during the island-hopping campaign against the Japanese across the Pacific Ocean. 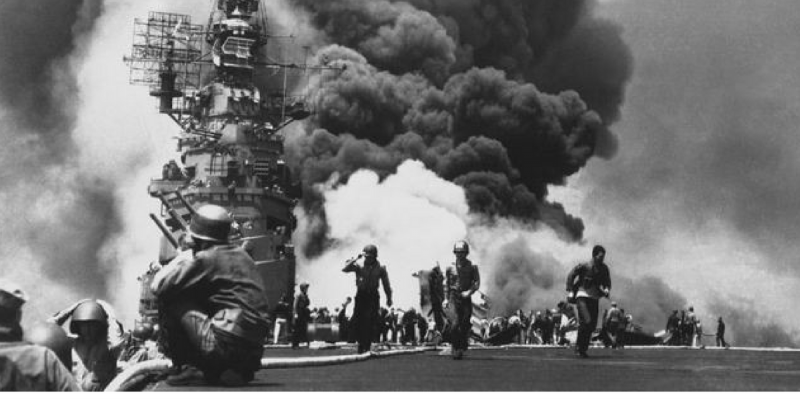 Bunker Hill took part in battles in the central Pacific and southwest Pacific, as well as air raids on the Japanese homeland. Bunker Hill was laid down as Hull No. 1509 at the Bethlehem Steel Company’s Fore River Shipyard, Quincy, Massachusetts on 15 September 1941, and was launched on 7 December 1942. 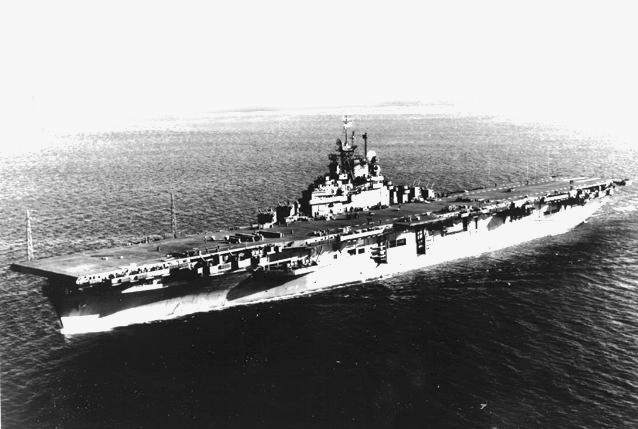 After her commissioning on 23 May 1943, the Bunker Hill began its service with Captain J. J. Ballentine in command. 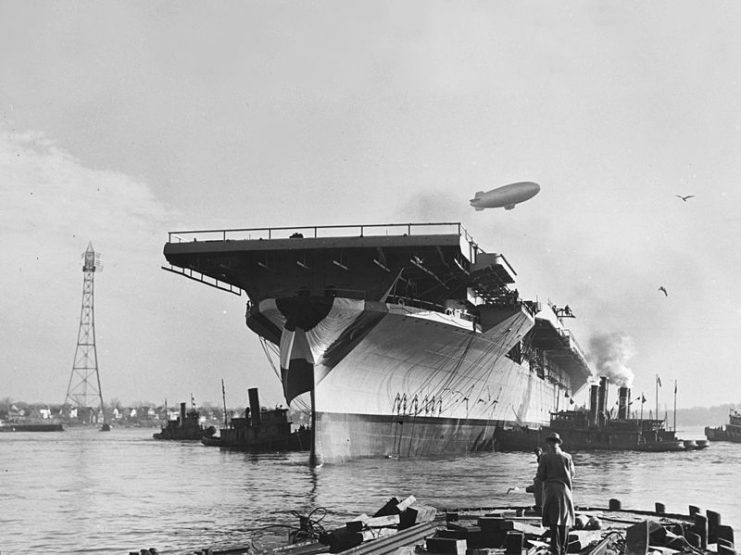 The U.S. Navy aircraft carrier USS Bunker Hill (CV-17) afloat immediately after launching, at the Bethlehem Steel Company’s Fore River Shipyard, Quincy, Massachusetts, 7 Dec 1942. 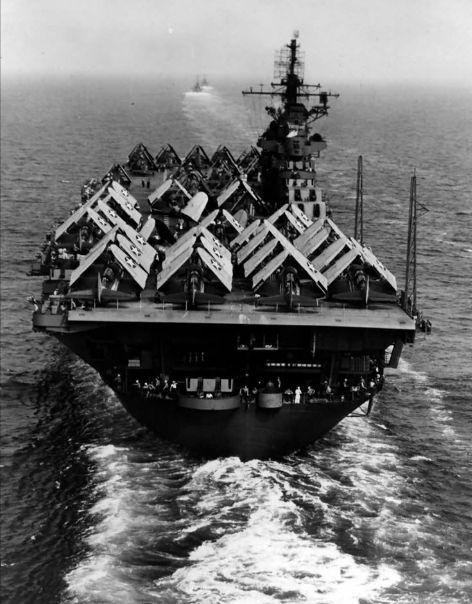 The Bunker Hill was designed to carry about 2,600 crew members, including both ship’s company and air wing. 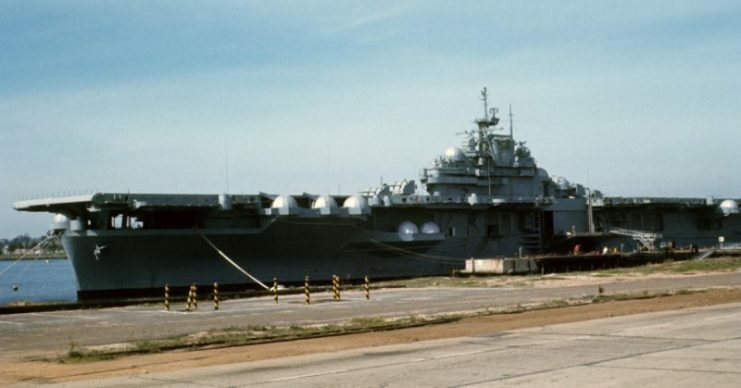 It had a standard displacement of 27,100 tons and full load displacement of 36,380 tons, and cruised at a speed at 32.7 knots. 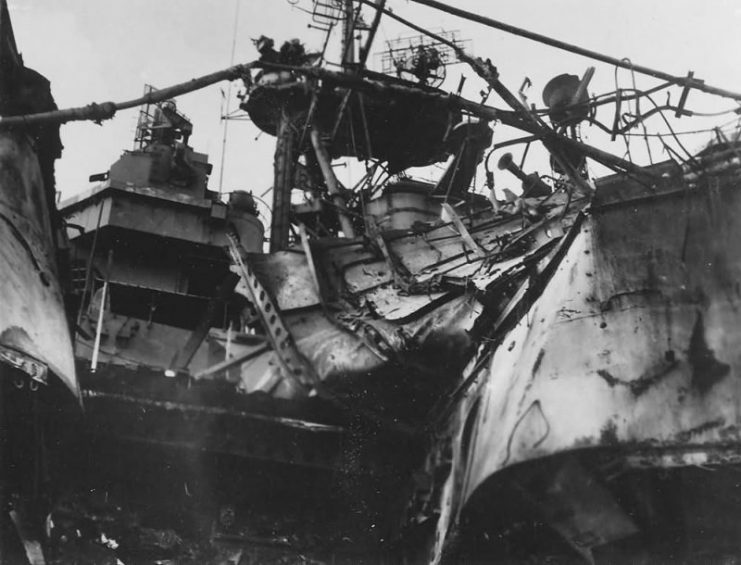 For armor, her belt was 2.5 to 4 inches thick, and the bulkheads were 4 inches thick. 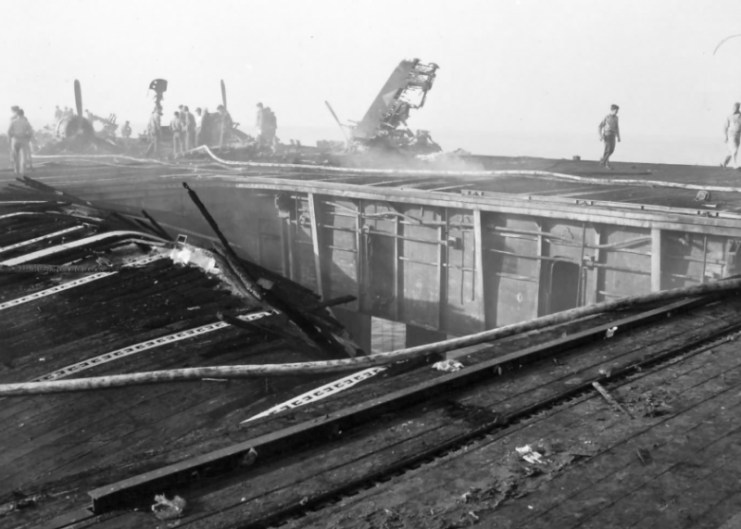 The STS top and sides of the pilot house alongside its hangar and protective decks were 1.5 inches thick, and the top steering gear measured a thickness of 2.5 inches. 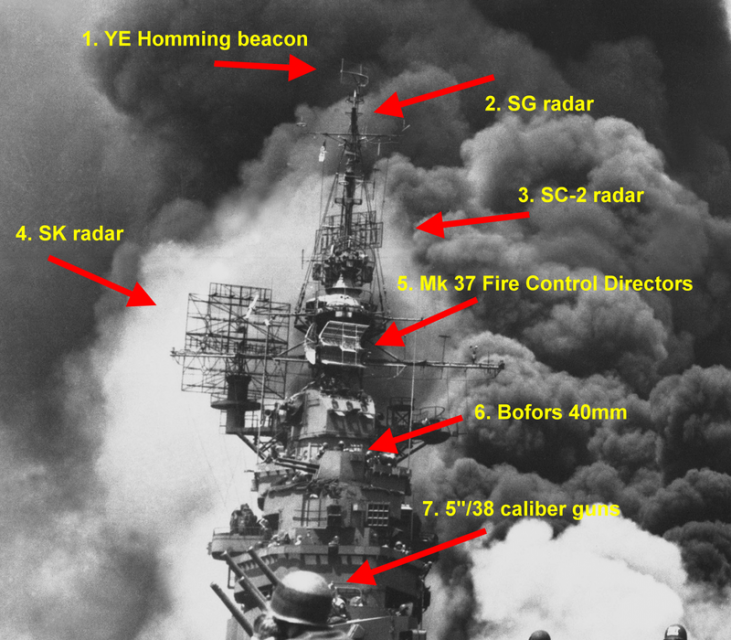 Its armament comprised 4 twin and 4 single 5″/38 guns, 8 quadruple-mount 40mm/56 guns, and 46 single 20mm/78 guns. 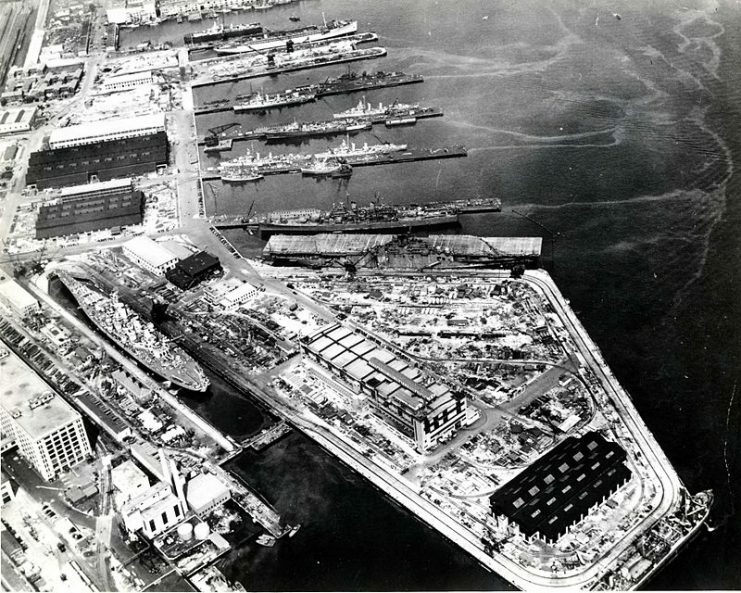 Bunker Hill could carry about 90-100 airplanes. 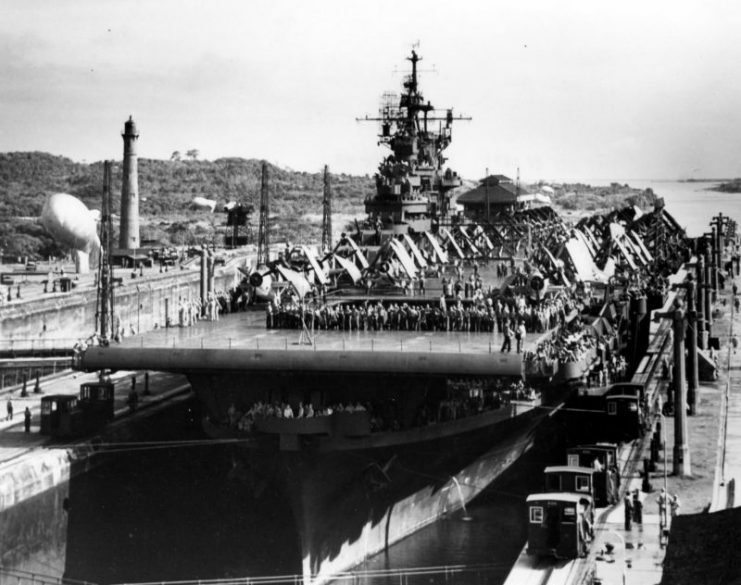 After departing Pearl Harbor in November 1943, the Bunker Hill, along with USS Essex and USS Independence, took part in a large air raid at Rabaul, a major Imperial Japanese Navy base. 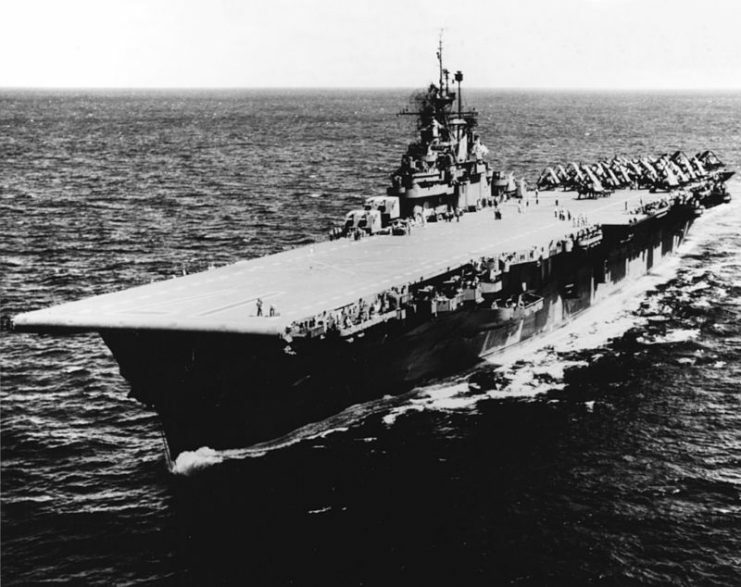 Three days later, Bunker Hill was headed to the Gilbert Islands to cover the invasion of Tarawa. 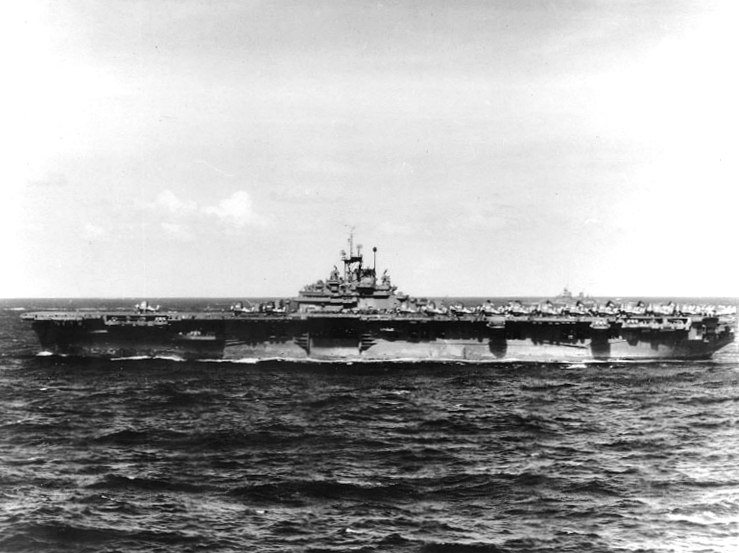 The U.S. Navy aircraft carrier USS Bunker Hill (CV-17) underway in Puget Sound, Washington (USA), on 19 January 1945. 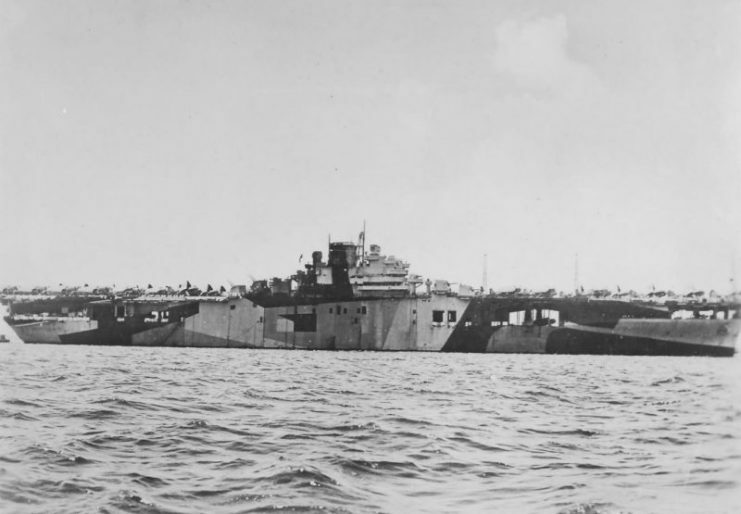 On three occasions running from December 1943 to January 4, 1944, the Bunker Hill took part in air raids on Kavieng to support Allied amphibious landings in the Bismarck Archipelago. 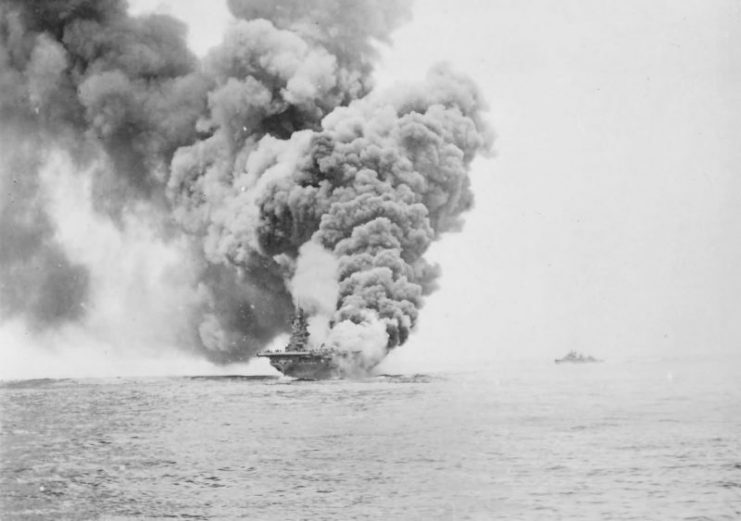 Bunker Hill was also involved in many other raids scattered across the Pacific, including at the Marshall Islands, Truk, Guam, Tinian, Saipan in the Marianas, and the Palau Islands. 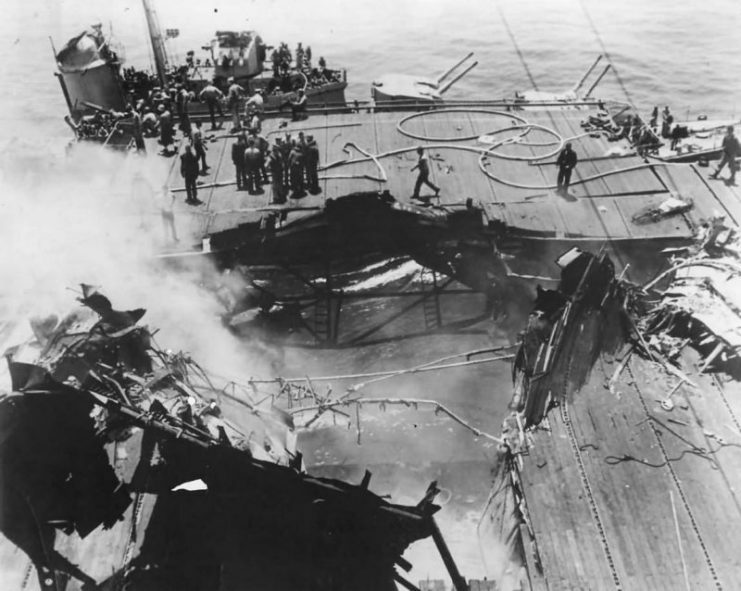 The Bunker Hill took part in the Battle of the Philippine Sea, during which it was struck by a Japanese bomb, resulting in two deaths and eighty injuries. 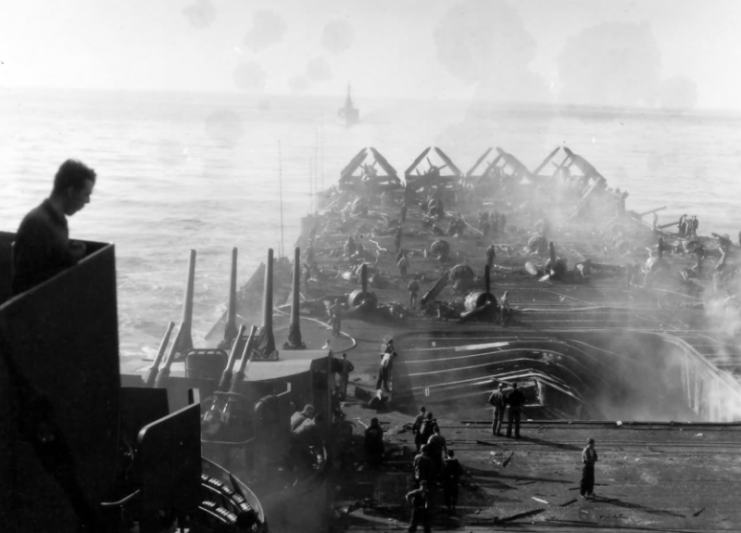 But it continued to fight in its damaged state, aiding the Allies in the destruction of three Japanese carriers and about 600 aircraft. 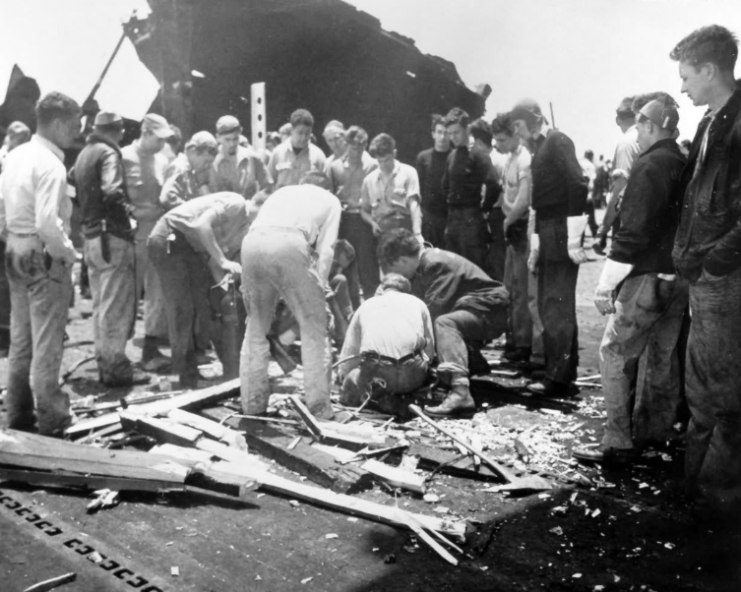 On 11 May 1945, while Bunker Hill was supporting the invasion of Okinawa, two Japanese kamikaze planes struck and severely damaged the aircraft carrier, with casualties exceeding 600–in addition to the many wounded, 346 were confirmed dead and an additional 43 sailors were missing. 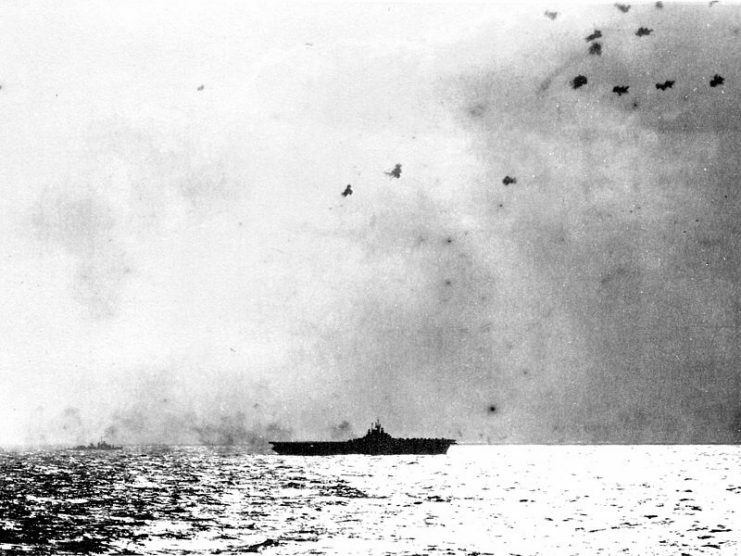 USS Bunker Hill (CV-17) at sea while participating in strikes on the Palau Islands, 27 Mar 1944. 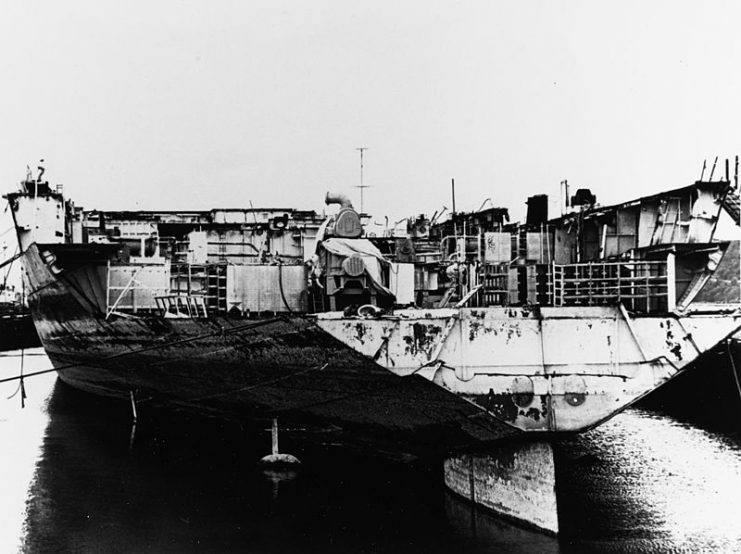 The Bunker Hill was withdrawn from active service after it returned to the United States mainland for repairs, and was decommissioned in 1947. 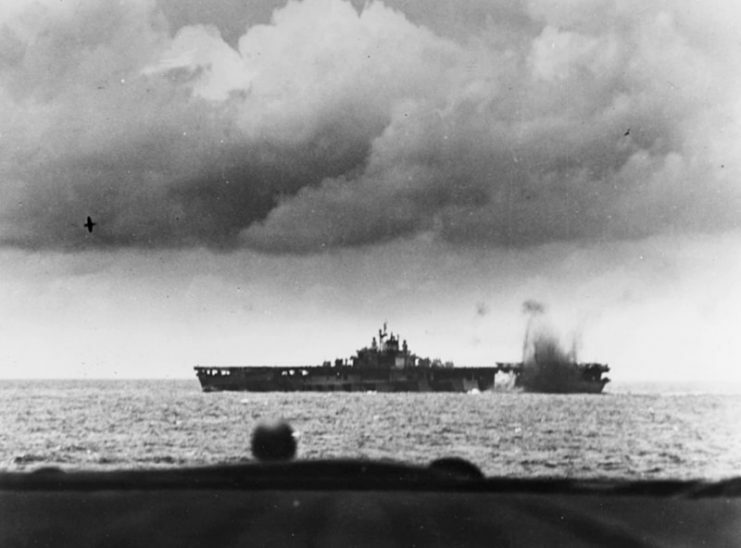 USS Bunker Hill (CV-17) launching aircraft during raids on the Marshall Islands, c.a Jan 1944. 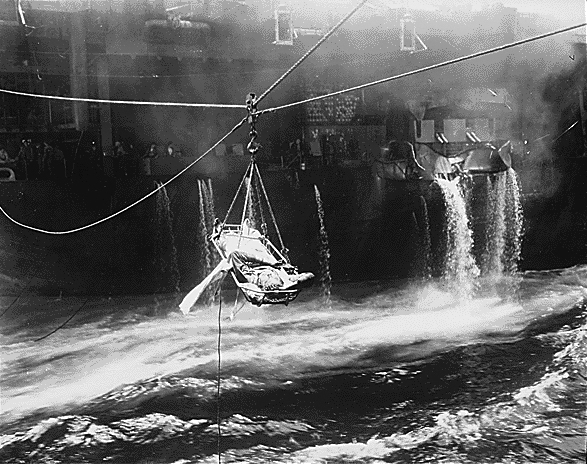 The “Holiday Express” received several honors and awards over the course of its service in the war, including the American Campaign Medal, Presidential Unit Citation, World War II Victory Medal, Asiatic-Pacific Campaign Medal (11 stars), Philippine Liberation Medal, and Philippine Presidential Unit Citation. 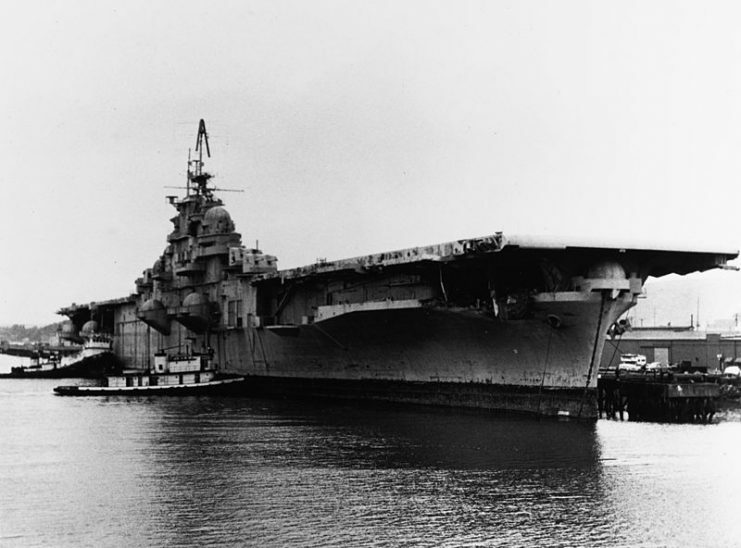 The U.S. Navy aircraft carrier USS Bunker Hill (CV-17) being scrapped at Tacoma, Washington (USA), circa in 1973. 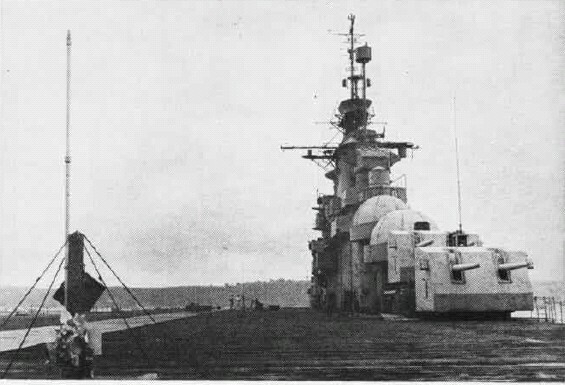 The U.S. Navy aircraft carrier USS Bunker Hill (CV-17) arrives at Tacoma, Washington (USA), to be scrapped, April 1973. 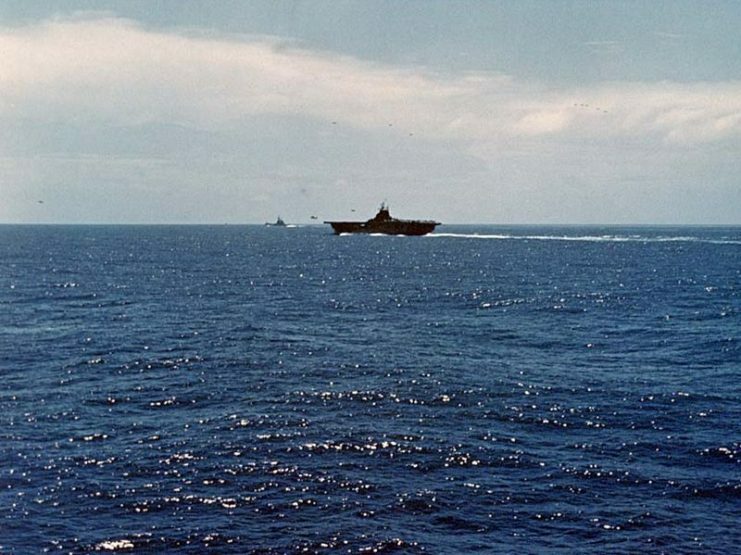 In the right foreground is the aircraft carrier USS Bunker Hill (CV-17) and a Baltimore-class heavy cruiser, either USS Baltimore (CA-68) or USS Boston (CA-69). 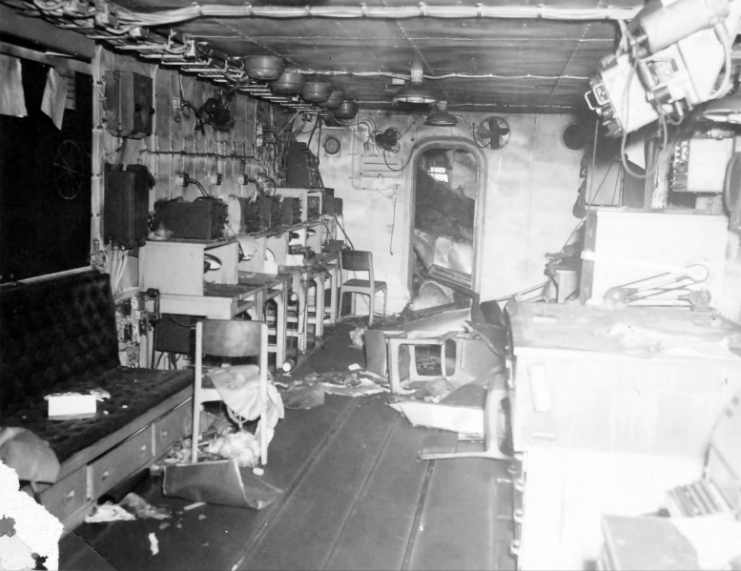 Hole in Flight Deck of USS Bunker Hill CV-17 after Hit off Okinawa. 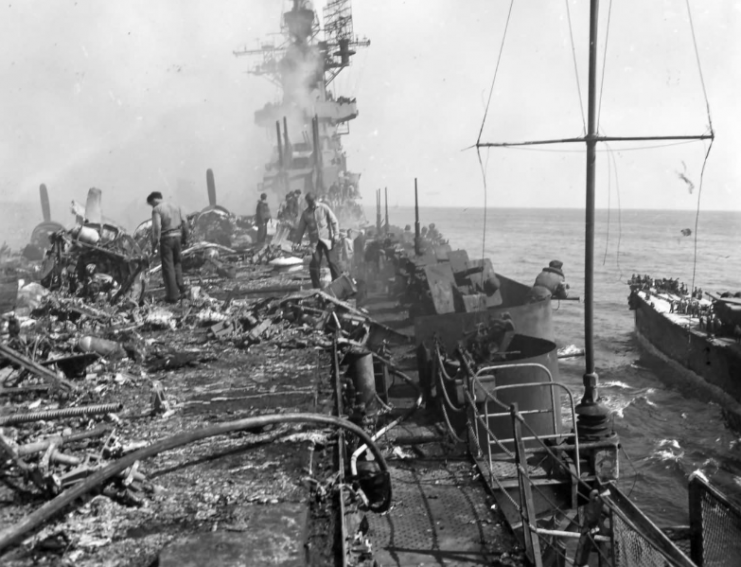 Damaged flight deck of USS Bunker Hill. A Japanese kamikaze suicide plane (Yokosuka D4Y “Judy”?) 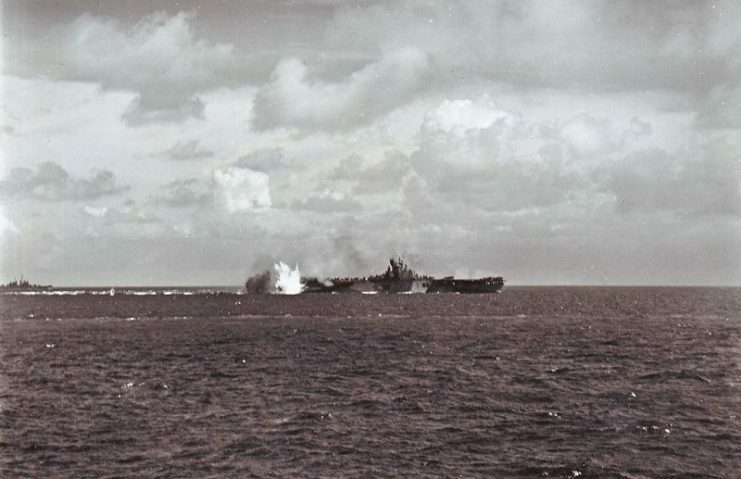 attacks the U.S. Navy aircraft carrier USS Bunker Hill (CV-17) off Okinawa, 11 Apr 1945. 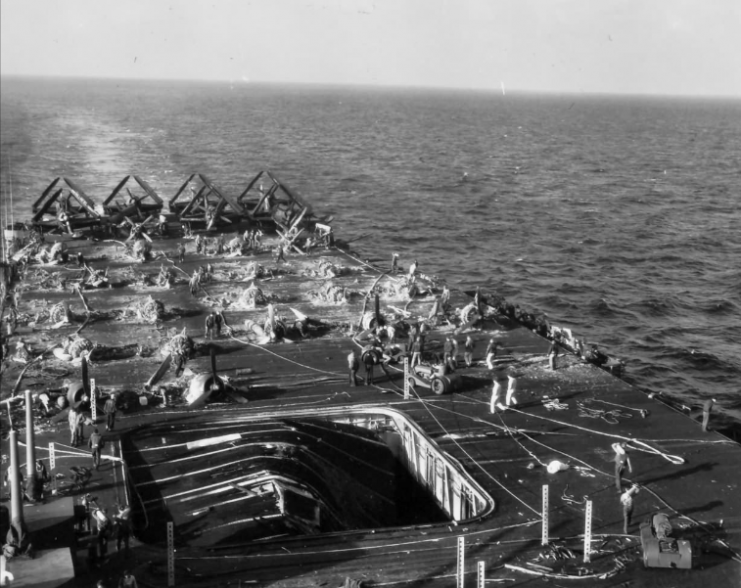 It was shot down and crashed aft of the ship.